Nicole Lord, a former dancer turned fitness instructor, owns Mischief in Motion, a Pilates studio in Mischief Bay, California, a small coastal town near Los Angeles. Thirty-year-old Nicole took a big risk opening the studio, but her business is growing. She is justifiably proud of what she has accomplished, and her son Tyler, just turning five, is an even bigger source of joy and pride. Unfortunately, she cannot say the same for her marriage. Six months ago, her husband quit his lucrative job with a software development company to pursue his dream of writing a screen play, presenting his decision to Nicole as a fait accompli. Nicole is trying to control her resentment over his making such a decision without discussing it with her first, but the distance between her and her husband of six years seems to grow greater day by day. Her marriage has lost any real sense of intimacy, physical or emotional, and Nicole finds herself wondering if it can survive. Thank goodness she has a strong support system in her two best friends, women she met when they enrolled in a Pilates class. Shannon Rigg decided when she was a child that she was going to become a successful, independent woman who had the means to grant her own wishes. At forty, she has succeeded beyond her dreams. As the chief financial officer of a billion-dollar software company, she holds a job that she finds interesting and satisfying. An annual salary in mid-six figures ensures that she can indulge her love of fashion and travel, but her focus on her career has exacted a price on her personal life. Two broken engagements and a current affair that is high on passion but low on emotional connection have her doubting if her hopes of becoming a wife and mother will ever be realized. A new man met through an online dating service seems to be her version of Mr. Perfect, but can he accept the demands her career makes? Pam Eiland appears to have everything—a devoted husband with a prosperous business, three adult children who are happy, successful, and still eager to spend time with their mom and dad, and strong friendships that enlarge her life—but when her daughter announces that she is pregnant, fifty-year-old Pam is struck with an inescapable awareness of growing older and the changes age is bringing to her body and her psyche. Just as a couples retreat renews the sizzle in her marriage and an appointment for a facelift offers the promise of at least limited rejuvenation, Pam is struck with a blow so devastating that she wonders if recovery is possible, even with the help of family and friends. Three women at three different stages of life are confronted with major changes in their lives and the necessity of making decisions with far-reaching consequences. They will discover that every challenge life throws at them can be faced with their own resources and a little help from their friends. 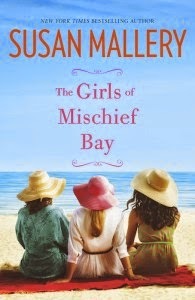 With The Girls of Mischief Bay, Susan Mallery returns to women’s fiction with its focus on the personal journeys of women and the friendships that sustain them. Although I am a long-time fan of Mallery’s romance fiction and am eagerly anticipating the four Fool’s Gold stories set for release in 2015, there is something special about her women’s fiction novels with their celebration of the strengths and friendships of the female characters. I particularly liked the fact that in this new story Nicole, Shannon, and Pam are so different from one another. Mallery shows that these differences—in age, experience, and lifestyle—add dimensions to their relationship. Another quality that made the novel ring true for me is the way Mallery shows the lives of these women overlapping through their friendships while at the same time showing that each woman has a life larger that their close friendships. Mischief Bay is another Mallery-created town that serves as a warm, credible setting for the story. The characters who inhabit the setting made me laugh and cry and long to give them advice and hugs. If you are a fan of women’s fiction novels that feature characters who evoke affection and sympathy, you should definitely add this one to your list. If you are strictly a romance reader, you should be aware that this book will not give you a traditional HEA for all three characters. If you can live with that, you will find two wonderful beta heroes and strong romantic elements. Susan Mallery is one of my auto-buy authors; The Girls of Mischief Bay joins my extensive collection of Mallery keepers. As always, look forward to another Mallery book. Looking forward to this one, too. She is one of my autobuy authors. I'm looking forward to this new release. I enjoy her small town books. I do enjoy her characters.I like a little more romance in my books I will have to check out Mischief Bay. Thanks for your review Janga. I enjoy books that explore people at the different points in their lives. So much focuses on the 20 to 40 year olds and the Over The Hill gang best left behind. Those of us over 50 are still active, still want affection, and are experiencing our own set of problems. It sounds like she has done a good job of blending the elements of the different life stages and given us something worth reading.